One could argue that Sadaharu Oh and Hank Aaron are personally responsible for creating millions of baseball fans worldwide. Now, years after both men have retired from professional baseball, they are still sharing their love of the sport with the younger generation through the World Children’s Baseball Foundation (WCBF) and its annual World Children Baseball Fair. 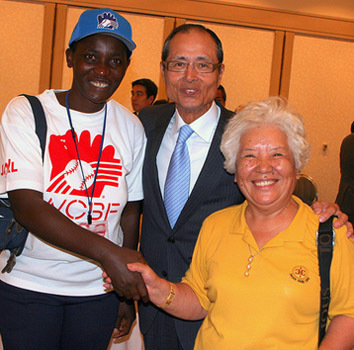 This year’s 20th WCBF event will be held in Tokyo from July 29th to August 6th 2010. The weeklong fair will feature numerous events hosts for children and adults from 23 nations. International friendship games will be played between Australia, Japan and Chinese Taipei to present the skills of baseball at this age category. Other participating countries and regions include: Australia, Canada, China, Cuba, Czech Republic, France, Hong Kong, Indonesia, Italy, Japan, Korea, Malta, Micronesia, New Zealand, Netherlands, Pakistan, Puerto Rico, Saipan, Singapore, Sweden, Thailand, Tunisia, and USA. In addition to baseball activities, cultural and recreational activities will also be scheduled to enhance cultural understanding and appreciation among the participating nations. Participating children will represent their respective countries to introduce their own cultures to children from other countries.About WCBF - A non-profit organization established in 1989 by World Home Run Kings Sadaharu Oh and Hank Aaron along with Dr. Akiko Agishi, the World Children's Baseball Fair was established to foster global understanding and cultural exchange through the celebration of baseball. 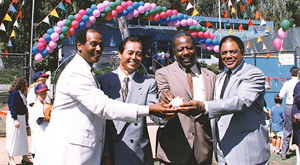 Recognizing that the sport of baseball promotes teamwork, good health, discipline and friendship, Mr. Oh and Mr. Aaron conceived the idea of the WCBF as a means of creating goodwill and fellowship among the children of the world. Today, countries from 5 continents participate in this global event! Spokespersons and supporters have included: Joe DiMaggio, Duke Snider, Ernie Banks, Willie Mays, Reggie Jackson, Lou Brock, Luis Aparicio, Tommy John, Harmon Killebrew, Steve Garvey, Peter O'Malley, Rod Dedeaux, Tommy Lasorda, Mrs. Bart Giamatti, Bowie Kuhn, Tim Brosnan, Brooks Robinson, Mrs. Jackie Robinson, Mrs. Roberto Clemente, and many others. Most of the supporters have been with WCBF since the first year and have provided ongoing support.